Successfully Added Creative 3D LED Lamp - 2 Light Modes, 7 Colors, Power Through Micro USB Or AA Batteries, 5Watt to your Shopping Cart. The perfect LED decoration light for anybody who loves photography. This 3D LED color light features the design of a camera, giving it an extraordinary look while in use. Perfect to be used as decoration in your living room, child’s bedroom, or as an eye-catcher in your photo study or store-front – this LED light is guaranteed to set the right atmosphere for any occasion. This LED color light features a 3D design, providing you with a stunning visual experience while turned on. Supporting 7 different colors, this 3D LED light is sure to fit right in at any occasion. Simply use the button to select any color of your liking or select the automatic color changing feature to enjoy all the offered colors to the absolute most. By allowing you to select between different colors, this LED light is sure to fit the liking of anybody out there. Coming with a micro UBS port, this beautiful LED decoration can be powered either through a USB cable or regular AA batteries. With a power of 5W, this LED light emits a smooth and dimmed colored light, creating a calm yet eye-catching environment. 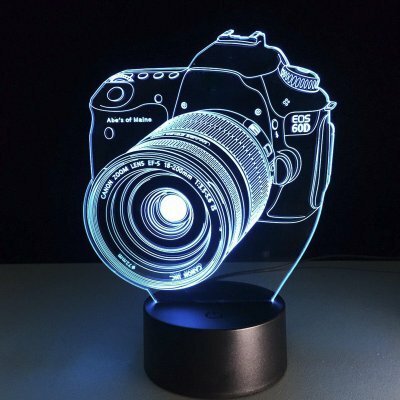 Not only is this LED light a perfect accessory for any photography loving household, it additionally is a perfect decoration piece that suits well in any store-front out there as it is sure to grab the attention of people passing by. Built from acrylic material, this 3D LED color light is safe to use and friendly to the environment. Creating a truly stunning light effect, this LED light truly is a perfect gift for anybody who is into photography. Simply plug in your USB stick or AA batteries, select the color of your liking, and you’ll be all set to enjoy a smooth and stunning 3D LED light effect that is guaranteed to spice up the interior of your living room or business. This 3D LED light comes with a 12 months warranty, brought to you by the leader in electronic devices as well as wholesale electronic gadgets..
Arabic: - الصمام الخفيفة الديكور - Chinese Simplified: - LED 装饰灯 - Czech: - LED dekorace Light - Dutch: - LED-decoratie-verlichting - French: - Lumière de LED décoration - German: - LED Deko Licht - Hebrew: - נורית LED קישוט - Hindi: - नेतृत्व सजावट प्रकाश - Hungarian: - LED dekorációs fény - Italian: - Luce di decorazione - Japanese: - LED 装飾ライト - Korean: - LED 훈장 빛 - Malay: - Lampu hiasan LED - Norwegian Bokmål: - Dekorasjon lampe - Romanian: - LED lumina decoratiuni - Russian: - Светодиодные украшения - Spanish: - Luz de LED decoración - Thai: - ไฟ LED ตกแต่ง - Turkish: - LED dekorasyon ışık - Vietnamese: - Đèn LED trang trí.